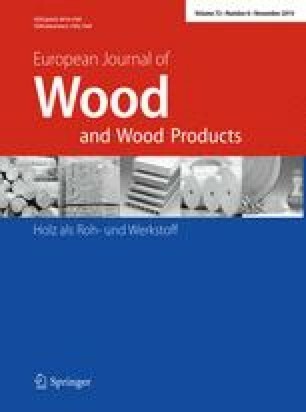 The authors studied the variability of mechanical properties and density within poplar wood veneer. Determinations (EN 310 1993) were done using a tensometer particularly suitable for test pieces of small dimensions, by means of a 100 daN load cell. The bending test method developed seems to be able to provide reliable results, that confirmed the expected strong influence of the ring portions on both density and MOR (latewood being of course heavier and stronger), a difference which seems, however, less noticeable in false heartwood.